When life gives you carrots, make these healthy hearty Carrot Pancakes. 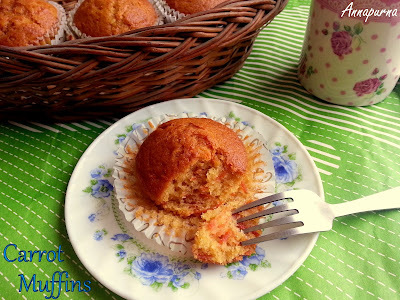 And when it is for the International Carrot Day, which is celebrated on 4th April, this is the perfect breakfast treat ! These gluten-free, refined sugar free and egg-less pancakes are fluffy, soft and mildly sweet with hints from warm spices, cinnamon and dry ginger. Peanut Butter and almond milk add richness to the pancakes. Served with cinnamon flavored stewed apples ,walnuts and pomegranate arils, these flavorful and protein-rich pancakes are wholesome and filling as well. The recipe is simple and easy to follow and ready under 30 minutes from scratch. Carrots is a root vegetable and regarded as one of the world's healthiest food. They are found in many colors including yellow, white, orange, red and purple. 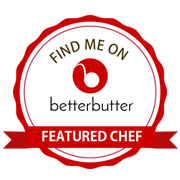 They are crunchy, delicious , highly nutritious and versatile. They can be eaten raw, steamed or cooked. One can add carrots to daily diet in the form of salads, juices, smoothies, stir fries , puddings, desserts and bakes. They taste great in both sweet and savory dishes. Carrots are an excellent source of Vitamin A in the form of beta-carotene. They are also good source of several B-vitamins, vitamin k ,potassium, fiber and antioxidants. 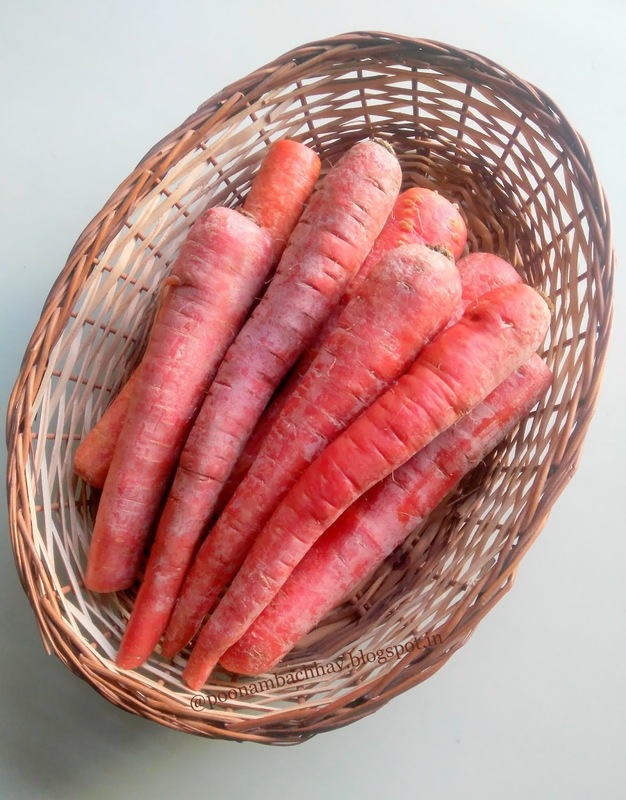 Some of the health benefits of carrots include improved eye health, reduced risk of cancer and heart disease, healthy skin , lower cholesterol levels and aid in weight loss. Click here to know more about nutritional facts and health benefits of carrots. In a mixing bowl take oatmeal. Add cinnamon powder, ginger powder, baking powder and salt. Mix well. 2. 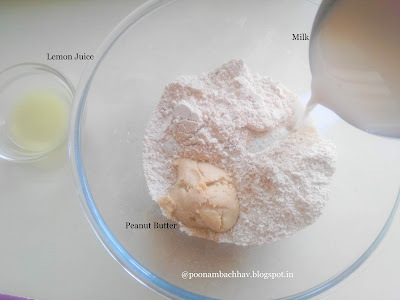 Next add in Peanut Butter, milk and lemon juice. Mix everything very well. 3. 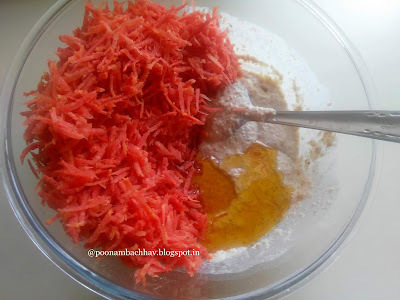 Now add grated carrots and honey to the batter. 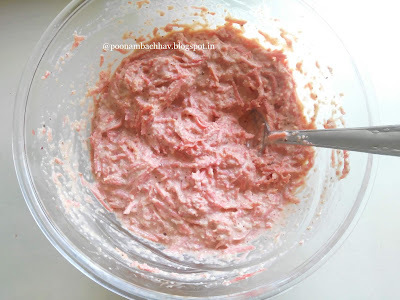 Fold to mix all the ingredients well and get a lump free batter. The pancake mix is thick and not pour-able, but can be easily spooned on to the pan. If the mix appears very thick, add a splash of plant based milk or water to attain the desired consistency. 4. Heat a greased pan on medium flame. Add ladle full of pancake mix on the pan. Do not spread. Drizzle some oil on the edges of the pancake. Cover and let the pancake cook on low to medium flame for about 1-2 minute. You can see bubbles form and burst. 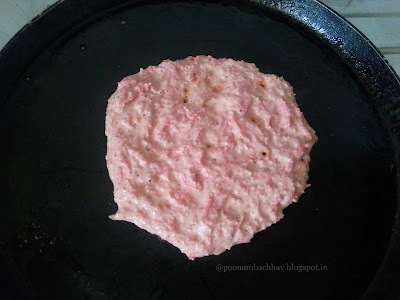 Delicately flip the pancake and cook on the other side as well until brown. This will take another 1 minute. 5. Make all the pancakes similarly. Keep the cooked pancakes in a stack in a warm oven while the others are getting cooked. We can make the stewed apples simultaneously. For that in another pan take the diced apple. 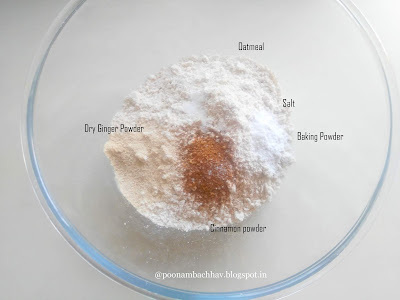 Add jaggery powder, cinnamon powder and sprinkle some water to it. Cook the apples on low to medium flame until they are soft. 6. Once ready, stack the pancakes, top them with cinnamon flavored stewed apples, walnut chunks and pomegranate arils . Drizzle some honey if you love and serve warm ! I have used homemade peanut butter in the recipe. Click here for the recipe. Have used almond milk here, you may use coconut milk or any other plant based milk. To make it a vegan recipe, replace honey with coconut sugar to make the pancakes and drizzle them with maple sugar. You may add any berries or fresh fruits and nuts as toppings. The pancakes taste great without any toppings as well. Keep the cooked pancakes in a stack in a warm oven while the others are getting cooked. You may simply add all the ingredients in a blender to make the pancake mix. 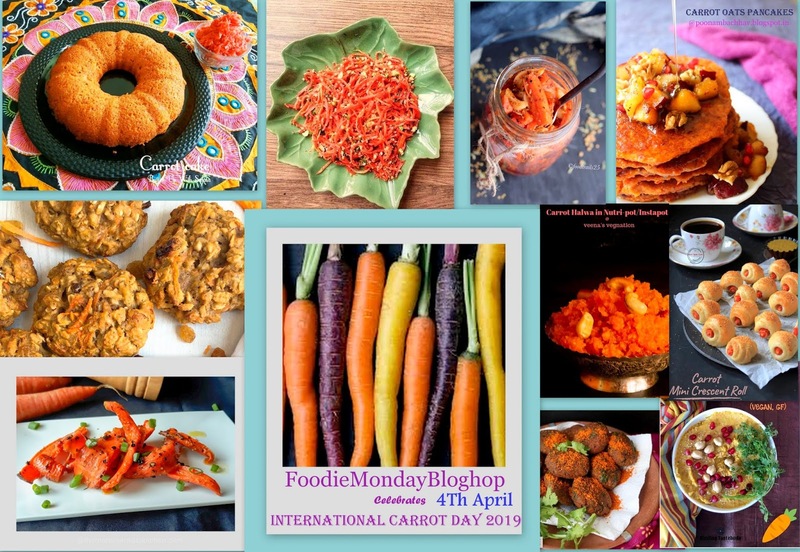 Taking these delicious carrot oatmeal pancake recipe to the #189 #FoodieMondayBlogHop with #GajarKaJalwa as the theme for this week. 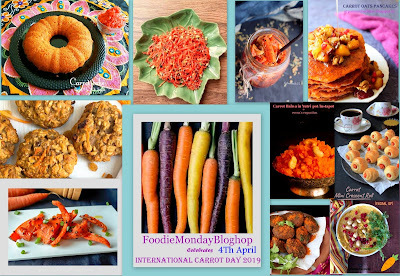 The theme was suggested by me taking into consideration the upcoming International Carrot day on 4th April. This day is celebrated each year since 2003 like a fest, to spread knowledge about the health benefits of eating carrots. In many countries, people throw carrot parties at home, dress up in orange color and serve carrot dishes to their guests. 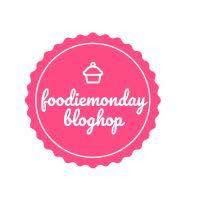 So we @foodieMondayBlogHop proudly claim to be carrot ambassadors and spread a message through our carrot delicacies. Include the super food carrot in your daily diet and reap its amazing health benefits. Chalo hum bhi dikhade sabko gajar ka jalwa ! 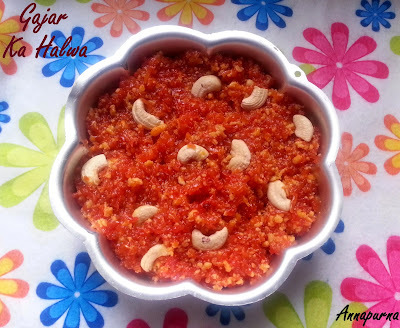 If you like the post or try out this recipe ever , feel free to drop a comment below this post. I would love to hear from you. 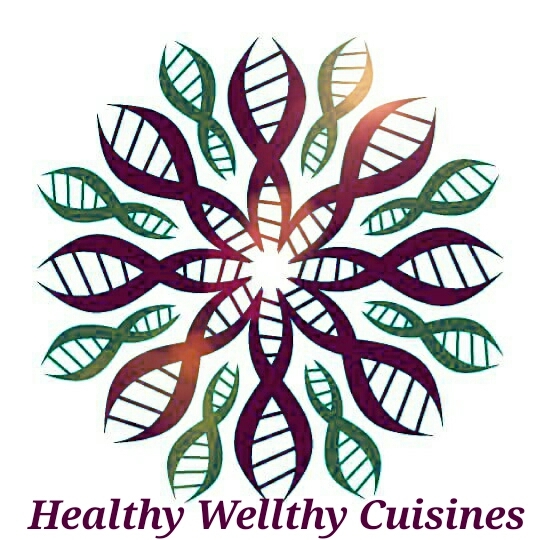 Follow us on #Facebook #Instagram , #Twitter, #Pinterest and #Google+ for more recipes and new updates. 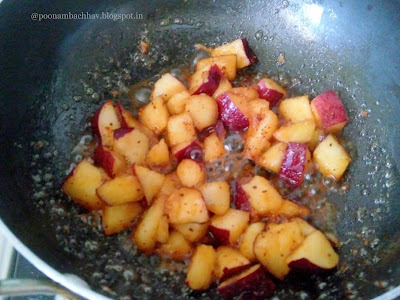 Poonam these pancakes look so delicious.. perfectly cooked,melt in mouth and these stewed apples are like cherry on cake. Loved the use of all the healthy ingredients from flour to sweetner for making these yumm pancakes. Thank you so much Swaty. I am glad you liked the recipe. Do give it a try. Wow, these pancakes look just pperfect and absolutely delicious! I love that they are eggless too. Great recipe. these pancakes using star ingredient as carrot is an awesome idea to feed kids! glad that you used the powder of oats here. 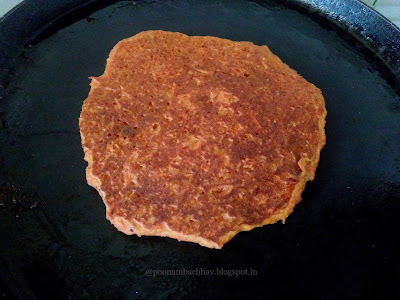 Loved these super healthy pancakes Poonam. Oats carrot dried ginger cinnamon peanut butter wow all the ingredients are so flavourful and mouthwatering. I will try your stewed apple soon. I can imagine the heavenly taste. Poonam these pancakes look so delicious.What an awesome idea to add grated carrots to the oats. 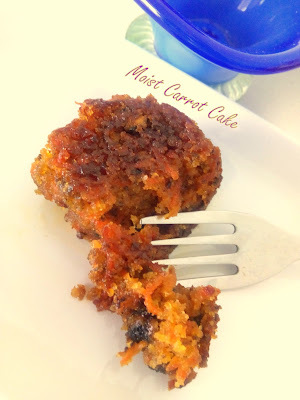 A lovely way to get kids and fussy adults to enjoy oats and carrots. Serving them with stewed apple makes it a wholesome breakfast. 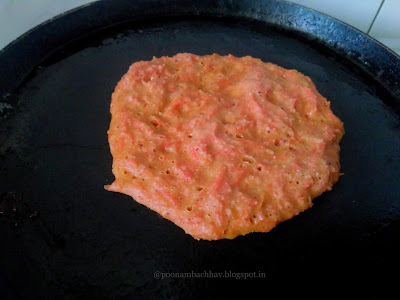 These Pancakes loaded with all the goodness of carrots look scrumptious. 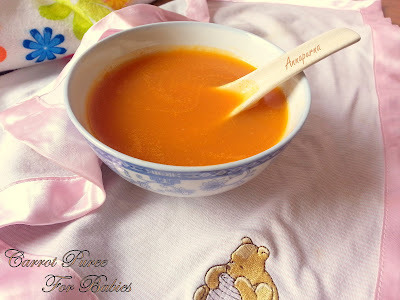 Great recipe to serve fussy eaters. Wow! Amazing pancakes. These pancakes are delicious n healthy. I think I will forget that I don't like cinnamon n dig into these pancakes.